Taught in age appropriate classes, we teach valuable self-defense techniques from Nihon Goshin Aikido in a fun and non-competitive environment. Self-defense, conflict resolution, anti-bullying techniques, stranger awareness and self-confidence are emphasized. Small and personalized classes help students integrate seamlessly into our new learning environment. Students learn to work well with other children, problem solve, listen and speak with respect. Focus and concentration skills are developed and improved upon. As children learn these important skills, it enhances other areas of their lives. Many of our students demonstrate improvement at school, and less social problems with friends, classmates and family members. Developing Self-Discipline – One of the most important principles in any form of competent martial arts training is an absolute focus on self-discipline. Today’s children are accustomed to receiving instant gratification at every turn. The lessons in self-restraint and discipline are perceived as old fashioned principles of the past. However, children who develop in a traditional martial arts environment are continually reminded, by example and personal experience, of how essential self-discipline is to being successful in life. Encouraging Physical Activity – It has been historically proven that human beings are designed to be physically active. Our ancestors developed in very harsh and demanding environments. In the last 3 decades, children in general are spending more and more time in front of television, computer or smart phone screens. Limiting screen time is a great idea when it comes to getting kids off the couch and encouraging them to be more active, but it only goes so far. By enrolling an inactive child in a physically demanding pastime such as Aikido, you not only discourage the sedentary lifestyle the child has become used to, but you also give him/her an enjoyable activity that inspires a healthy combination of mind and body. Developing Socialization Skills – Shy and awkward children who struggle to thrive in highly social environments find it easier to get to know people and make new friends when they’re in a class filled with peers who share a common interest. The children on the playground may not always have much common ground, but devotees to the martial arts are able to get to know one another through shared pursuits. Partner-driven forms like Aikido training, foster camaraderie, in that they have children pair off and build their skills together. In order for a child to master the skills he/she’s being taught and advance through the belt ranks, the child will have to exercise superior observation and listening skills. Martial arts techniques are very precise and require the child to focus intently on achieving mastery of the movements. The act of training the body also trains the mind, developing the ability to “think on their feet”, which increases awareness and critical thinking. Children who have focus problems, can learn to follow the demands of their instructors and benefit from the verbal and visual instruction in the dojo. 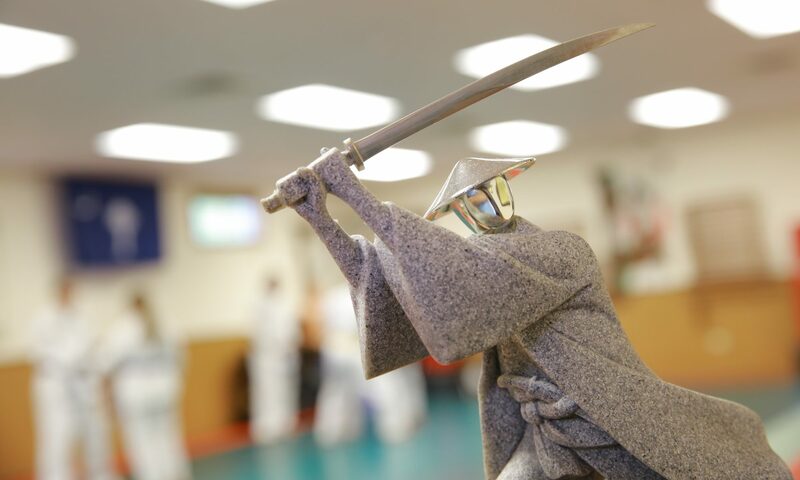 Improved Self-Confidence – As a student trains, he/she develop competence in the execution of Aikido techniques. From increased competence comes increased confidence. With every new achievement, your child’s confidence will rise. Children who struggle with a low sense of self-worth will learn that with hard work, sharp focus and respect for their training they will be able to control their own success. Understanding and Instilling Respect – Today’s society doesn’t always include respect for authority, adults or those in advanced positions. Martial arts are all about respect. Punching, kicking, throwing and locking are all secondary to the respect that is shown the moment a student walks into our dojo. Since martial arts techniques are powerful, safety in training must be directly linked to respect during every execution of a technique. Children learn to bow to their Sensei (instructor) and to their fellow students. They learn to “pay it forward” by understanding that in order for someone to give them the respect they desire, they must give it first. At the Wyndham academy your child will learn to respect the dojo, the instructors, their classmates, their parents, themselves and their community. Our instructors press upon the respect issue regularly and insist that their students practice respect at every opportunity. We feel that as they incorporate this respect into their lives, they will develop into mature and valuable members of our future society. Developing Teamwork Skills – Whether he/she is practicing blocking, kicking, executing a throw or participating in a movement game, there are few things that your child will do in class that will be done solo. Working together to learn new things and accomplish goals is an important life lesson for children to learn. Instruction in our classes can help your child learn that lesson. Reduction of Stress and anxiety – Today our children now face increased psychological pressures in our hectic society (at school, friends, extra-curricular activities, and social media). This can create stress, which can lead to anxiety. Training to deal with real world physical violence on the mats, against simulated attacks, will give the student a realistic perspective in regards to stress. This will, over time, produce a mental relaxation in the face of life’s challenges. With a combination of physical activity, breathing, and understanding their reaction to pressure, your child will learn skills to reduce stress, so it doesn’t impact their overall ability to achieve goals. Encouraging Non-Violent Conflict Resolution – Some people in our society think that martial arts instruction promotes violent behavior, similar to what is witnessed in television, movies and video games. In fact, at our academy we encourage and teach peaceful, non-violent conflict resolution skills and emphasize the importance of avoiding a physical altercation. Our instructors stress to every student that the use of physical Self-defense is only as a last resort.